"THINGS LOOK LIKE THEY'RE ABOUT TO GET MESSY…"
When William's butler Kevin abruptly takes over as campus pastor, William can't understand why he's suddenly given the cold shoulder. Meanwhile, a political conspiracy is brewing, and the Church is rallying to uncover the demonic possession of a member of the British government. When William stumbles upon a secret government conclave, all Hell breaks loose! With the battle for William's soul heating up between the forces of good and evil, can William hope to live a normal life? Madoka Takadono is a Japanese author best known as the writer of Gun Princess and Devils and Realist. 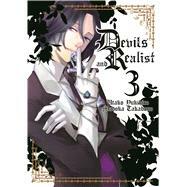 Utako Yukihiro is a Japanese manga artist whose works include Uta no Prince-Sama and Devils and Realist.